As you know this is a project that tries to unite Latin American sense of the underground scene, bringing music, graphics, and at the same time people, like you or me, all under a single motion,..SABOR!!! 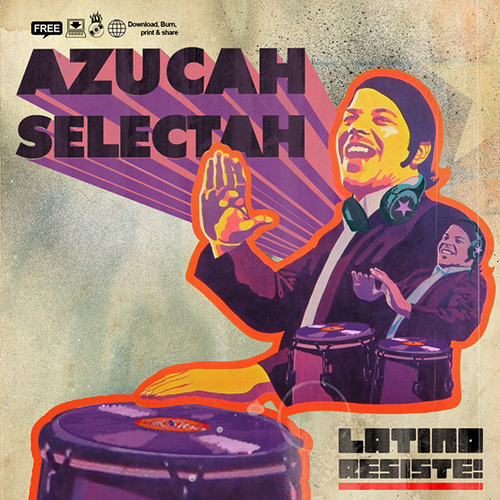 LATINO RESISTE presents AZUCAH SELECTAH!! Latino Resiste is a compilation of music, and slowly it’s turning into a social project!! 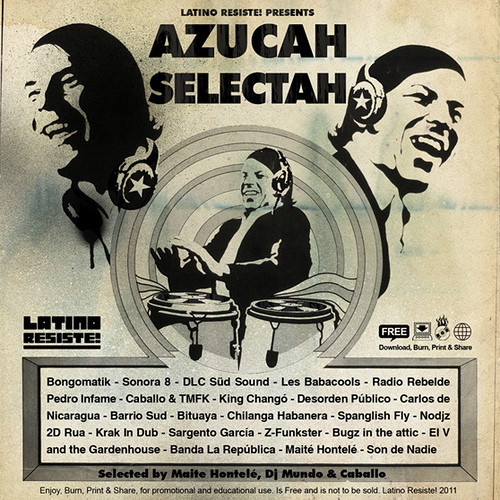 LR presents Azucah Selectah is trying to show the opinion and music from known and unknown artists, and also making sub thematic compilations that reflect a particular style of some Latin American trends, we are trying to show what is happening in Latin America Underground Scene. A work that drops an amazing selection coming from the eclectic tastes of the Golden Girl of Salsa, Maite Hontele, alongside DJ Mundo from Rebelsounds, and Caballo, all together in a project that attempts to show a new face of Latin music in terms of salsa, not Fania version of Salsa, neither your Orishas or Mixed version..
this is a movement that started growing slow but strongly from late nineties, although only until the end of the last decade emerges fully outside the so called “underground” in Latin America. We have seen great blogs like The Fader or even DJ Chino’s trying to approach people to this section of the Latin Culture, but it is still very away in terms of what is going on in our latinoamerican streets. This release will show you a HUGE portion of the sounds that are all over the clubs, although their exposure outside the Latin context remains very limited. show how close these Rhythms of pure salsa, Descarga, boogaloo, Latin jazz, Guaguanco, etc. .. are of global trends such as fusion mestiza, drum n ‘bass, dubstep, ska, cumbia, and other genres that are blended in this album and try to push further the true essence of America. We have pretty much some of the coolest sounds around!! KING CHANGO, SERGENT GARCIA, Les BABACOOLS, drop their UNRELEASED TUNES!!! RADIO REBELDE, MAITE HONTELE, SONORA OCHO, LA REPUBLICA, BITUAYA, PEDRO INFAME, DLC SUDSOUND, are just a small portion of the great sounds you will find. From the fields of Cuba, Dominican Republic or Valle de Cauca there is nothing more precious than sugar cane, that’s where salsa was born, and this is where the best refined sugar in the world. Salsa is the sugar of Rum, blood of congas, sweat of dancers, the sugar of Latinos!! Selected by Maite Hontele, DJ Mundo & Caballo. All music donated by the artists!! Special thanks to Maite Hontele for her great selection, attitude and songs and a very big THANKS to Deejay Mundo, whose knowledge of the underground made this compilation something all latinos can be very proud. and it is based on the 70s style, very IZZI SANABRIA!!! very Henry Fiol, Fania, Hector Lavoe!! Even you can print this cover and put it on your CD!!! so u can have the vinyl!!!! BUT DONT FORGET TO SEE THE BOOKLET!!! WHEN WE SAID LATINO RESISTE IS THE GAME CHANGER.. WE MEAN IT!!! Link doesn’t work? Any other way to get this?